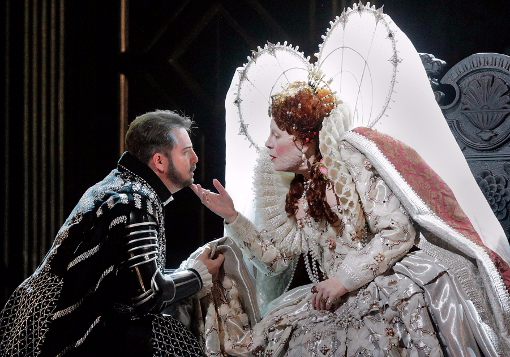 Roberto Devereux by Donizetti completed Sondra Radvanovsky's tour de force trilogy of Donizetti's three queens in a single season. For my money this is the opera that most suits her gifts. Overheard talking to myself, "But this is a wonderful opera." Perhaps it is wonderful because a constantly enraged queen suits so perfectly the voice of Sondra Radvanovsky. I did not see in Sondra's portrayal the nonsensical pseudo-butch portrayal of Bette Davis, but saw instead someone with difficulty walking and deteriorating health. Each of the four stars listed above gets wonderful music, perhaps also perfectly suited to their gifts. Benini found the drama in the singing. What a mess of a plot. Perhaps Roberto once truly loved the queen as she clearly thought he did. And then he fell in love with the decades younger and still unmarried Sara. He goes off to war and after clearly winning it, he is accused of being a traitor. While he was away, Sara with the queen's help married the Duke of Nottingham because her father died. Women at that time required the protection of a man, either husband or father. The opera opens with her clear unhappiness. It is not clear if she is unhappy because Roberto is returning, or if perhaps it is her marriage to someone she does not love and who seems also not to love her. The queen marches down into her tomb and dies at the end. This is a poetic rather than a historically accurate ending. The opera plot more closely resembles the movie The Private Lives of Elizabeth and Essex than it does historical fact. 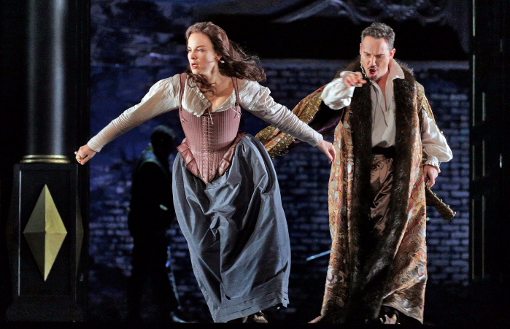 It's important to remember that opera is about love, and historical accuracy is irrelevant. Debbie Voigt announced it as a play within a play, but this is only true if you count the fully costumed chorus clapping when the audience clapped. In the bows the characters turn and bow to the chorus. This was all discrete and not at all annoying. It provided a context for the frequent choruses. In the period there would have been courtiers standing around watching. I loved it. It was filled with both beautiful singing and overwhelming dramatic intensity. And yes, that was indeed "God save the Queen" in the overture. Saturday here in Denver was a blizzard washout for the HD cinecast -- even though I volunteered to go up on the roof and sweep the snow off the satellite dish -- so we had to make do with the Wednesday replay. Terrific singing all around with one of Donizetti's more imaginative scores. For example, he used the same tune in the first-act duet between Roberto and Sarah as with the last-act duet between Roberto and Elizabeth. The only difference (other than the lyrics, of course) is that in the former the mezzo sings above the tenor, and in the latter the soprano sings below the tenor. Lots of other "reusing touches" throughout as well, which I prefer to think of as clever rather than laziness. I was not crazy about the staging. Kwiecien seemed to wander around the stage during the first half of the opera, almost as if the director didn't know what to do with him whenever he wasn't singing. And ENOUGH already with the extreme close-up shots. One glance each at Polenzani's sweaty jaw and Radvanovsky's rubberized forehead was plenty, but the director simply kept 'em coming. I like how Marius explained, during his interview with "Debbie" Voigt, how the quartet went out of their way to sing collegially and avoided any one-upmanship onstage. You always hear how actors and singers are "the bestest friends" at awards time; it's nice to know it can be true in real life.